(NaturalNews) In case you haven't heard, 500,000 people have been left without drinking water in the city of Toledo, Ohio, and store shelves there have been stripped bare of water. I find it absolutely astonishing that I was unable to locate a single news story in the mainstream media which made this connection between agricultural runoff and the Toledo water crisis. Every single MSM story I found simply blamed the algae, as if Mother Nature has gone bad and is trying to kill everyone. In reality, it's mankind that's gone bad and is poisoning the planet. Algal blooms are just the symptoms of an ecological imbalance. This would also save money, as water treatment facilities are spending millions of dollars just to remove algae toxins from their water. "Toledo spent about $4 million last year on chemicals to treat its water and combat the toxins," reports USA Today. Everything we're seeing now -- Ebola outbreaks, weird tropical viruses, the Plague, superbugs, flesh-eating bacteria and water supply toxins -- are all just signs of how humanity has damaged and imbalanced the ecosystem. And until we stop the mass poisoning from agriculture and industry, it's only going to keep getting worse. Today there are 500,000 people in Toledo who have no drinking water. But if humanity doesn't change its ways, that's going to rise to 5 million people in California, or 50 million people across the USA, or even 500 million people across the globe who have no access to clean water because of the extreme damage caused by the industrialization of agriculture. When chemicals and fertilizers are sprayed on crops, they don't merely disappear. They get washed downstream and end up in rivers, lakes and oceans. Mankind is currently residing over the planet's sixth great extinction event. The journal Science, in fact, has reported that Earth is right now in the midst of a great extinction caused by humankind. "The journal Science reports more than 320 animal and bird species alone have vanished since the 1500s," reports News.com.au. "Most other animal populations from among the more than five million species on our planet have declined by an average 28 per cent." As this mass extinction is taking place, keep in mind that there are droves of "chemical denialists" who claim all these agricultural chemicals are harmless. These are the same people who also claim GMOs are harmless, in case you're curious. They're the pushers of atrazine, glyphosate, 2,4-D, Agent Orange, DDT, neonicotinoids and other deadly chemicals. These people are the poisoners of our world, and they front the for-profit agendas of powerful chemical corporations. Pro-business publications carry their propaganda stories which claim ridiculous things like "honey bee populations are not collapsing" or that DDT is good for you. It's frustrating that all attempts to stop the poisoning of our planet are characterized as "leftist agendas" by conservative business publications. Even I'm sometimes called a leftist for merely seeking to stop the corporate poisoning of our world. That's especially funny because as Natural News readers well know, I'm a rifle-owning, liberty-loving Texan who favors lower taxes and secure borders -- but I'm also strongly pro-environment, pro sustainable living, pro organic permaculture and wholeheartedly opposed the mass corporate poisoning of our world. In my view, political affiliations don't matter if we're all dying from the collapse of a global ecosystem that we destroyed with our own foolish ignorance. What does it matter if we vote Republican or Democrat if we're so full of toxic chemicals that we all die of cancer? If I had to pick a philosophical belief system that I really feel strongly about, it would be a system that declares all life to be sacred and seeks to protect living ecosystems from the poisoners who are systematically destroying it. 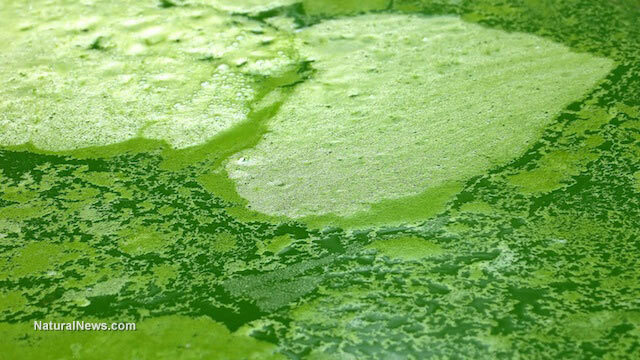 The algal blooms of Lake Erie are Mother Nature's way of sending us a Biblical-scale warning sign: We must stop our destructive ways or we will sooner or later have to drink our own poison. I hope humanity has the wisdom to heed these warnings signs before it's too late. I fear, however, that we have already crossed the threshold and that runaway infectious diseases and ecological collapse will now run their course over the next 50 years. Cause and effect. We have committed the cause, and now the planet has begun to deliver the effects. Prepare yourself for what's coming, because it is now abundantly clear that the era of cheap, plentiful food and water for everyone has come to an abrupt end. The water is flowing with poison in Ohio, and in some places (like California) it's barely flowing at all. Perhaps it's time human civilization grew up and started behaving like an adult community of wise beings who consider sustainability beyond the next fiscal quarter.